Firefox 3.5 tends to crash when opening flash video in full screen. You should update to the latest version of Ubuntu and Firefox if you know how to to see if you can fix the error. If you can’t, try the steps below. 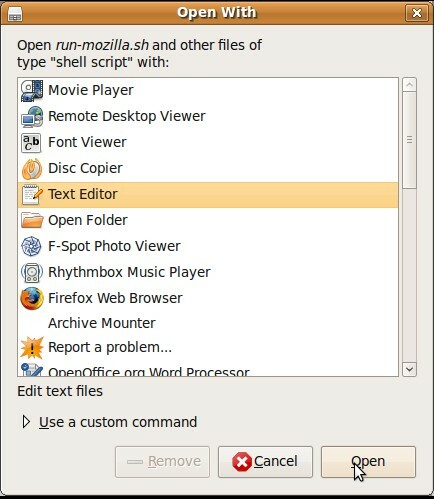 Open firefox.sh with a text editor at /usr/lib/firefox/firefox.sh or the folder where you installed Firefox 3.5 to. Right click firefox.sh or run-mozilla.sh pick “Open with Other Application…” from the right click menu. Choose the “Text editor” program in the Open With window. Press Open. Add the code shown after this sentence to the second line of firefox.sh by opening firefox.sh with a text editor and going to the second line and pasting this code on the 2nd line.